An experienced letterpress printer may feel an odd sense of disorientation when looking at a Liberty platen press. All the familiar pieces seem to be there, but they don't go together like a C & P or Pearl. The ink disk feeds ink to the rollers, but the rollers don't travel very far -- the disk slides underneath them. The platen and bed both move, meeting in the center of the press. Degener's Liberty Press. An interesting job press, called the Liberty, was invented by F. O. Degener, of New York, in 1860. The bottom edges of the platen and bed were hinged together, and they raised and opened out into a horizontal position to receive the sheet, the bed passing under the ink rollers on the way up. The platen and bed then closed for the impression with a hinge-like motion, again inking the form on its downward sweep, and causing the ink disc to pass under the rollers. This was a popular press for a short time because of its power and speed but best results were not possible because of its clam-shell action. It was also called the Noiseless Jobber. 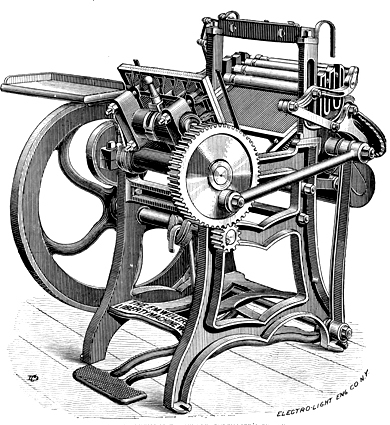 Erik Desmyter and Bob Oldham wrote a 22-page article,"The Libery Press: a platen job press invented by Frederick Otto Degener," giving the complete history of the Liberty Press, for the Journal of the Printing Historical Society, New Series number 10, spring 2007. Copies of the issue can be ordered from the Printing Historical Society in London, United Kingdom. If you have new information about Liberty platen presses, please contact me. Take a look at a table listing known Liberty presses, including location, press size, and serial number. If you come across a Liberty platen press, there are several key characteristics to look at to determine its date of manufacture. Here's a page on how to identify a Liberty press. In their article, Erik and Bob point out that a number of Liberty press advertisements include the wording "more than n in use," where n is a number that kept changing. By noting the publication dates of these ads, we can get a rough correlation between a press's serial numbers and its year of manufacture. It appears that 250 to 400 presses were produced each year, starting in 1860. Before 1886, the average rate was 385; afterward it was 273. Steve Saxe provided scans of Liberty Press parts. He writes, "The Liberty press parts diagrams are on two sides of a single sheet. The sheet was too large for my scanner platen, so I had to stitch two scans for each side. The sheet is very old and stained, but readable. It came to me via Martin Speckter from Damon & Peets, which was still in lower Manhattan in the 1970s." 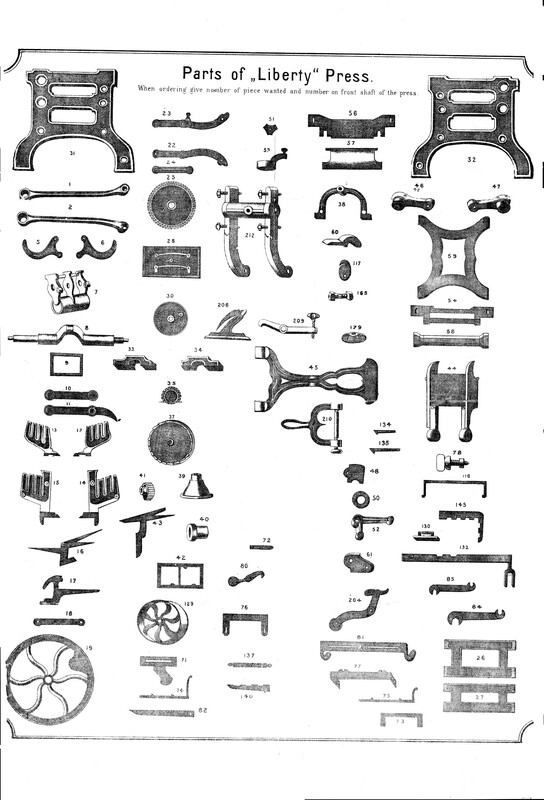 One diagram, titled Parts of "Liberty" Press, shows 82 parts (numbered between 1 and 210). The second, titled New Parts of the Liberty Press, shows 46 parts (numbered between 300 and 359) with names of most in both English and German. F. O. Degener received three patents related to the Liberty platen press, dated Apr 24, 1860, Dec 13, 1870, and May 28, 1872. He received an extention for the original patent on April 24, 1874. These patent and extension dates were included in the shield surrounding the serial number on most presses manufactured from about 1875 until about 1890. Between 1886 and 1889, Frederick Van Wyck received three additional Liberty-related patents. 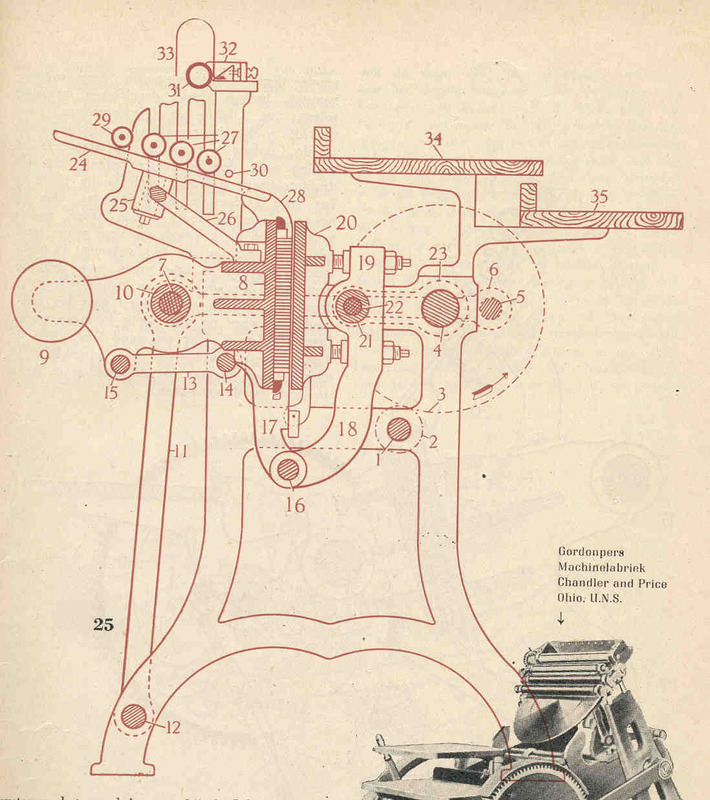 After these improvements, the press was marketed as the "New Style Noiseless" Liberty press. PDF files containing images of these six patents have been downloaded from the official United States Patent and Trademark Office website. The Liberty press with serial number 10266 is the only one found (so far) with a plaque that lists the following nine patent dates: Nov 19, 1885; Febr 23, 1886; Aug 31, 1886; Oct 16, 1886; Oct 30, 1886, Nov 4, 1886; Nov 10 1886; March 3, 1887; Aug 16, 1887. Patents have been found for only the first and last of these dates. Most of the other dates in the list are invalid for U.S. patents as they do not fall on a Tuesday. VOLCKE, J.A. : Boekdrukmachines. Amsterdam, De Arbeiderspers, 1946. Gebonden. 110 p. Ills. Voor de Stichting Graphilec. In the same textbook, John found a reference to another manufacturer in Europe who made Liberty presses. John translates the text on the picture as "Liberty-platen made by machine-factory, Joseph Anger and Sons, Vienna, Austria." Scans from English language magazines and catalogs covering 1874 - 1890. Western European advertisements for Liberty (or Liberty-like) presses scanned by Herwig Kempenaers, a Liberty press owner in Belgium. Articles and ads from Hungarian magazines provided by Julianna Füzesné Hudák of the Kner Museum. The manufacturer's name changed from "F. M. Weiler's Liberty Machine Works" to "Liberty Machine Works" around May 1886. They moved from 51 Beckman to 54 Frankfort Street. They were "successors to Degener & Weiler." 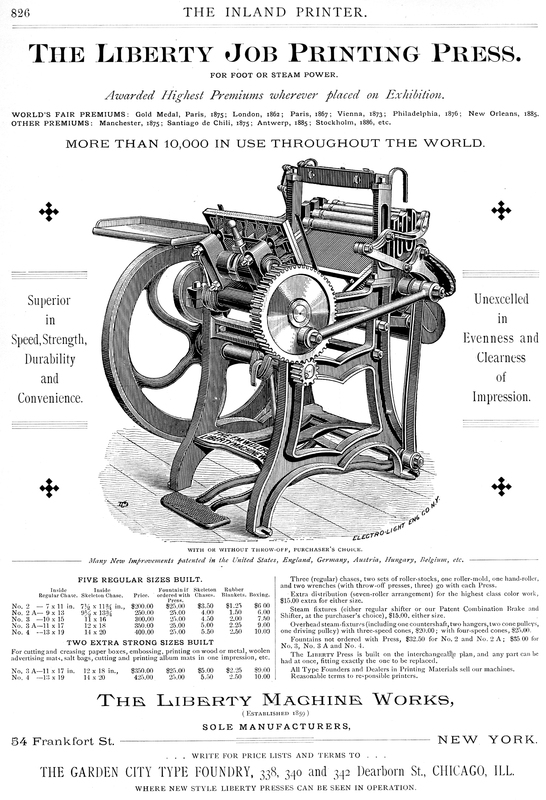 In 1888 they touted advanced features of their redesigned "Noiseless" press. It got rid of six specific problems related to the "old Degener" press. Pictures in ads in 1886 and 1887 show the delivery board on the left side of the press. Beginning in 1888 the delivery board is back behind the platen (with a big cut-out for the throw-off) and the feed board is shown as attaching on the right. You can read detailed results of my search. One of the best sources for Liberty press information is the Letterpress E-Mail Discussion List (LetPress). Participants have described their own presses, talked about Liberty presses they've seen, and shared excerpts from books they've read. You can find the messages by searching the Archives Page for the words Liberty press. To receive LetPress messages or search the archives, you must join the list. Steve Saxe, Oct 22, 1996: At one point the firm was located in one of the arches of the Brooklyn Bridge, on the Manhattan side. The Liberty was called "half a press when closed, and two presses when open" because of the size when it was opened for feeding. 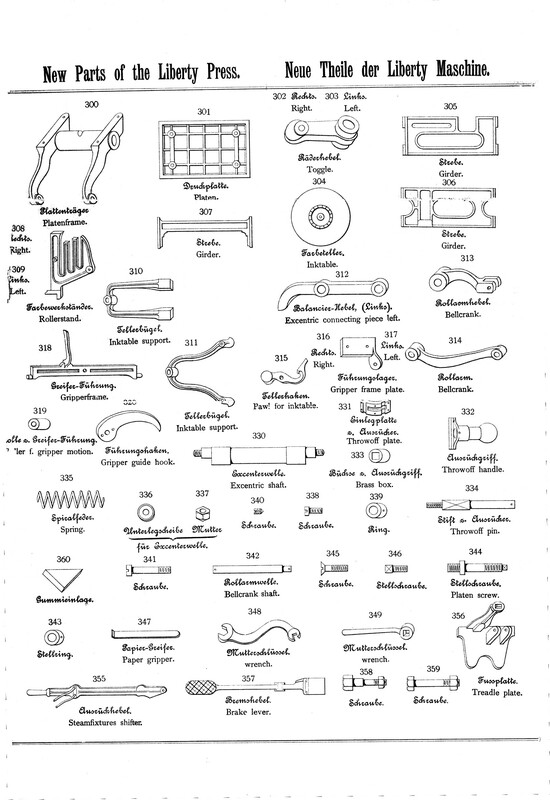 Steve Saxe, Jul 8, 1997: I have a contemporary (1870s - 1880s) parts diagram of the Liberty press, showing all the parts separately, each one named in English and German. Niall Cook, Apr 27, 1999: ... last week I moved a Weiler Liberty Platen about 50 miles from Tunbridge Wells to my home near Canterbury, England. Currently in (very large) pieces in the garage, I just need some time to clean it up and reassemble before being back at full steam. J. Mike Powers, Apr 23, 1999: There is one at the Heritage Museum in Libby, Montana. It was donated to our museum by the Museum of the Rockies to keep it from selling and being moved out of state. This press is historically important to Montana, as it may have been the second or third press introduced into Montana. 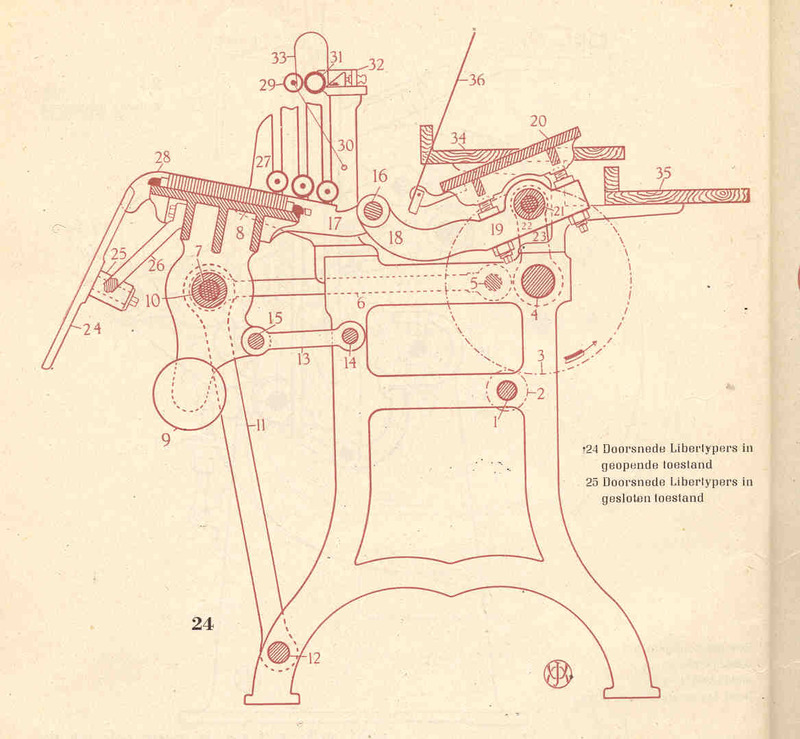 Steve Saxe, Apr 30, 1999: According to Ralph Green's A History of the Platen Jobber (1953; reprinted by Letpress listmember Hal Sterne, 1981) ... Otto Degener was a German who worked for Gordon, and who procured a patent for his own press, the Liberty. Degener's partner was another German, F. M. Weiler and the firm name was Degener & Weiler. Degener died in 1873 and his son, F. L. Degener succeeded him. Weiler bought out the son in 1877 and continued the business under the name F. M. Weiler. About 1881 Weiler established a factory in Berlin, Germany, where the Liberty press became popular. The press lost ground in the US, however, and Green says that after 1890 manufacture in this country was discontinued, and all Liberty presses after that date sold in the US came from Germany. Green adds that Liberty presses were still on the market in Germany until about the time of World War I.
Jim Gard, May 1, 1999: I've just returned from the San Jose Historical Museum this afternoon where we were printing bookmarks on our F. M. Weiler Liberty Press as a demonstration and advertising piece for some 300 special visitors today. Bruce Graham, Dec 26, 2000: Call the Cooperstown, NY, Chamber of Commerce to get information about the Farm Museum. They have (or at least had) a Liberty press in their print shop. Philip Driscoll, Aug 5, 2001: According to the "Catalog of World Paper Money," the picture is that of Khristo G. Danov ... These notes were issued in 1992. Nick Smith, Aug 6, 2001: Khristo Danov lived 1828-1911. He was a teacher & writer, responsible for the re-introduction of printing & publishing into Bulgaria - his first publication was a calendar which appeared in 1855. Whether he ever used a Liberty press seems doubtful - more likely the bank-note designer just chose it as a suitably archaic looking machine. Erik Desmyter, Aug 5, 2001: There are a few surviving F.M. Weiler Liberty presses here in Belgium in private collections and museums. Our own F.M. Weiler Liberty (serial number 12274) is deep dark blue with gold lines (on nearly all cast iron parts) and has the original ink fountain. Another F.M. Weiler Liberty press no.11883 also has the ink fountain and the owner informed me recently he thinks of selling this press. John Cornelisse, Dec 14, 2003: Somewhere near Antwerp, an old printer has a "small" liberty-press on the attic, and this press is gonna be a part of the exhibition in the MIAT-museum in Gent. Ted Shuart, Oct 22, 2004: I would like to add The Farmers' Museum's Liberty to the list. The press has a brass plate with the inscription "Liberty No. 2 Patented Apr. 24, 1860 by Fred Otto Degener NY". ... It is a dandy press and I use it for daily production running at least 40,000 copies a year on it. Erik Desmyter, Oct 24, 2004: I visited Barbara Henry at Bowne about 2 years ago and then the Liberty was dismantled in storage since a long time. Erik Desmyter, Nov 1, 2004: Liberty Machine Works sold also some other presses than the Liberty. Marc Cote, Nov 21, 2004: I have been asked by a church in Boston to sell a letterpress... I believe that the press has been there since the erection of the church... The press was used for baptismal certificates, church circulars and the like. 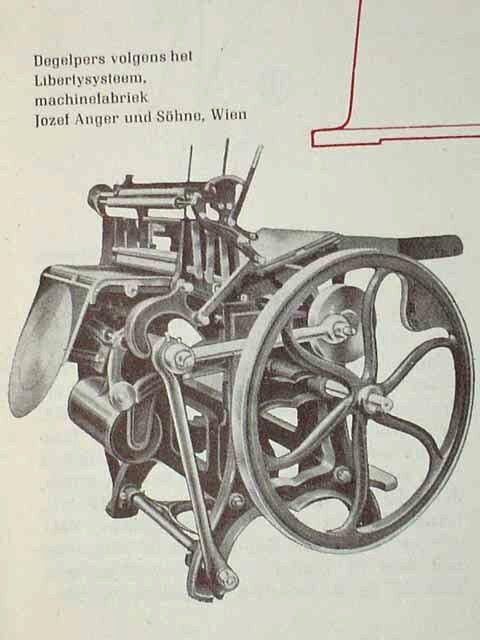 Bob Oldham, May 19, 2005: Ad Lib Press has just acquired Liberty platen job press #6706, a model 2A (9x13) made by Degener & Weiler probably between 1874 and 1877. Erik Desmyter, Nov 11, 2007: Together with Bob Oldham I have written a few months ago a 22 page article about the complete history of the Liberty Press for the Printing Historical Society in their Journal, New Series 10: The Liberty Press: a platen job press invented by Frederick Otto Degener. Göta Svensson, May 8, 2008: I am new to this mailinglist. Owner of 1 Liberty platen, 1 Heidelberg windmill and 1 FAG proof press. David Carpenter, May 8, 2008: My name is David Carpenter and I live in Warsaw Mo. I own a Liberty#2 (platen) press which was purchased by my great uncle Dr. B.P.Homan in the 1920's. Helen | Pepperina Press, Sep 3, 2008: Has anyone been to the Printing Works in the Genadendal mission? There is a very rare Liberty platen press there in the Drukkery, *not* the museum. Erik Desmyter, Nov 9, 2008: I don't know of any existing Liberty press videos but give me some time and I will create a small video for you of a Liberty in action and post it on YouTube. Dave Brune, Sep 25, 2009: I have a Model 2, Serial number 1180 that has been in my family for about 80 years. My grandfather started the Brune Printing Company with it many years ago. Thomas & Erik Desmyter put together a two minute video clip showing the operation of a Liberty-style press made by the Belgian manufacturer Henri Jullien from Brussels. Some aspects of the press, differ from Degener's Liberty, but the overall movement is the same. The Instagram hashtag #libertypress occasionally has a Liberty press. Erik Desmyter of Gent, Belgium, has a number of presses, including a Liberty manufactured about 1880. His Web site might contain some Liberty pictures, although he changes the content from time to time. The Briar Press on-line museum includes an entry for the Liberty. On Briar Press, there was a discussion about a Liberty press in South Africa. A Liberty press is featured in the History San José print shop at History Park in San Jose, California. A Liberty is on display at the Museum for the Printing Arts in Leipzig, Germany. The Kner Printing Industry Museum in Hungary has a permanent exhibition, Books from the Gyomai Kner Press, which includes a Liberty-style press manufactured by J. Anger & sons. The New Zealand Electronic Text Centre scanned the December 27, 1890, issue of Typo, including an advertisement for the Liberty. The Amalgamated Printers' Association Web site reprints "The Liberty: a Study in Exoticia" from the October 1976 issue of Type & Press. A collection of printed ephemera includes an 1888 color advertisement for Liberty Machine Works.